Successfully Added UFO Web Cam with Fan + Microphone to your Shopping Cart. Stylish webcam with MIC, fan, and built in white LED lights. This handy USB powered plug-and-play computer video camera will have you connecting to web video calls in moments with high quality and speed. A great computer addition for any person who wants to have fun or conduct business while chatting online. This is a great new twist to the webcam. 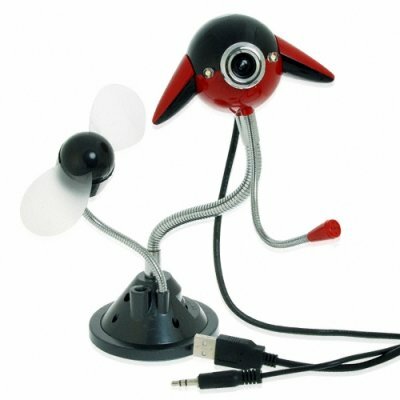 This deluxe edition features a UFO shaped computer video camera with an adjustable microphone, two white LED lights, and a soft safety blade fan. This unit also has a knob controlled suction cup base so you can easily attach it to any smooth surface. Another everyday use electronics product brought to you by your direct from China wholesale direct source, Chinavasion. Adjustable webcam with integrated fan and microphone. High quality - budget price. Bendable metal-arm pedestal with suction cup base for maximum mounting convenience. Can also be used for recording video with audio at home :-). Main function: Webcam with MIC, fan, and built in white LED lights.